Our lab seeks to uncover how cortical inhibitory neurons are generated, migrate, develop and mature. From the initial programming by transcription factors in progenitor zones until their final destinations in the brain, cortical inhibitory neurons undergo multiple developmental milestones. To this end, we employ a multitude of molecular tools and genetic mouse models to decipher how these complicated processes occur. Our projects range from understanding how key developmental genes normally operate to uncovering the mechanisms that underlie gene dysfunction in Autism Spectrum Disorder. We want to understand how mutations in the genes that cause Neurofibromatosis 1, PTENopathies and Tuberous Sclerosis Complex lead to symptoms in each disorder. While each disorder is distinct, they all have increased rates of ASD. One hypothesis is that some ASD symptoms could arise due to imbalances in brain excitation and inhibition. Our lab is investigating how the genes that cause these disorders function in inhibitory neurons and how their disruption alters the development and maturation of these cells. The gene, PTEN, is necessary early in development to establish the correct numbers of specific groups of inhibitory cortical interneurons (Vogt et al., 2015). 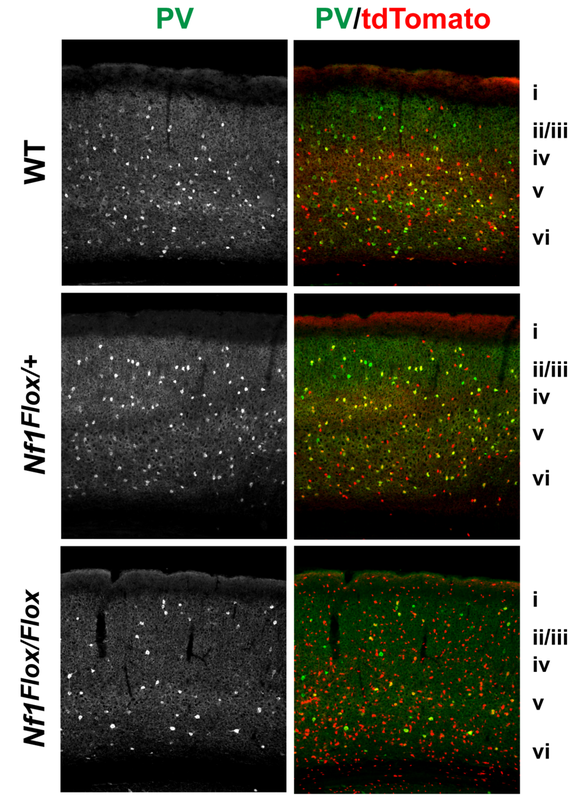 We observed a reduction in cortical interneurons and aberrant axonal growth of the parvalbumin (PV)+ group when PTEN was deleted from cortical interneuron progenitors (see images below). Notably, the dysfunction of PV+ cortical interneurons has been observed in other ASD animal models, suggesting that this cell type may be important for some symptoms of ASD. We also developed an efficient in vivo screening assay to determine the functional impact of human mutations in vivo. This approach is now being used to understand the impact of mutations in other genes. Our lab utilizes an efficient in vivo screening assay to determine how human mutations impact the function of high-risk disease genes in vivo. 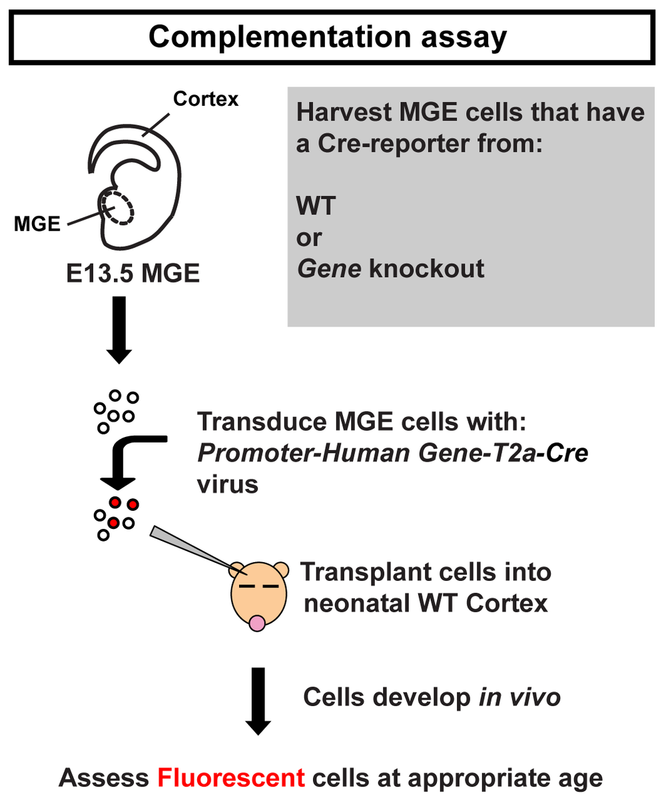 To this end, we combine lentiviral transduction with genetically-engineered mice to eliminate a given gene in mouse cells and replace it with a normal or mutated version of the human gene (Complementation Assay). This allows us to quickly screen the effect of the mutation during development and since the modified cells are transplanted back into a mouse, the cells develop in vivo. Currently, we are using the Complementation Assay to uncover how mutations in NF1 and TSC1&2 impact inhibitory interneuron development, as mutations in these genes cause Neurofibromatosis 1 and Tuberous Sclerosis Complex, respectively. In addition, these genes are being conditionally deleted from cortical interneurons in mice to determine their role during development. As we continue to uncover their roles in neuronal cells it may lead to novel insights into the basic development of these cells, disease mechanisms and potential therapeutic options. Our initial experiments suggest that loss of NF1 in progenitor cells from the median ganglionic eminence (MGE) results in an increase in total cells from this lineage and a decrease in PV+ interneurons (images to the right). Our lab is currently trying to understand the mechanisms behind these phenotypes. We hope these studies will help elucidate how mutations in NF1 lead to the high rate of ASD and alterations in cognitive function associated with the disorder. The genes underlying Tuberous Sclerosis (TS), TSC1&2, are inhibitors of the mTOR signaling pathway (schema to the right). Notably, so is PTEN, however, the proteins encoded by these genes inhibit this pathway at different stages. Our goal is to understand how these genes impact cortical interneuron biology in common and unique ways. We are currently investigating potential mechanisms that could contribute to the high rate of ASD and Epilepsy observed in TS patients, by conditionally deleting the gene, TSC1, from cortical interneurons at different stages of development. We hope to use this knowledge to not only understand TS, but also basic mechanisms of interneuron development and maturation.